MPs debated a petition on Monday 10 September to withdraw Article 50 if Vote Leave broke electoral laws. But hardly any MPs turned up. Of course, we all now know that Vote Leave did break electoral rules, with allegations of fraud currently being investigated by the police. But Tory and Labour frontbenchers rejected the calls to withdraw Article 50 over Vote Leave’s overspending. Some MPs complained that the debate, in Westminster Hall, clashed with another debate in the main House of Commons chamber on the same afternoon on ‘Legislating for the Brexit Withdrawal Agreement’. When I Tweeted a photo of the debate in Westminster Hall with hardly anyone there, many Tweeters expressed their fury. “Absolutely disgraceful, what has happened to MPs supposedly representing their constituents?” Tweeted @NotWhatIBelieve. “How far has UK democracy sunk, that cheating is dismissed with a shrug of the shoulder,” Tweeted @julian_rowden. “Shows how grossly irresponsible and cowardly most MPs are being over Brexit,” Tweeted @ChristophBennet. “This is such a joke. Incompetent government, useless opposition, upholding the result of a fraudulent referendum. Democracy is dead; there is no integrity left in British politics,” Tweeted @audrymaeve. “If anyone remains in any doubt as to the democratic credentials of both Tory and Labour parties this should clarify. This Country is mired in corruption,” Tweeted @MichaelMandb01. “I despair. MPs not doing their job. Democracy dead. Corruption admired. Fascist britain looms,” Tweeted @Jennie_Pawson. “That is our MPs for you. Only interested in themselves and their own advancement,” Tweeted @Johnantifas. “If it was about a pay rise it would be standing room only,” Tweeted @ASupermum. Many directly Tweeted their MPs to demand to know why they were not at the debate. “@alexsobel did you attend this?” Tweeted @AngryRemainer. 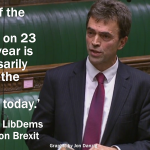 Alex Sobel, Labour Co-op MP for Leeds West, and a strong anti-Brexiter, was one the only MPs to respond. “I was in the main chamber for the Legislating the EU Withdrawal Bill debate. 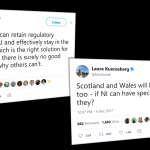 Here is my contribution http://bit.ly/2CGgJF8 It was a big mistake to timetable two Brexit debates at the same time,” he Tweeted back. “The Government knew there was a Westminster hall debate that day, triggered by many thousands of signatures. 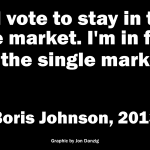 They then chose to put down their own Brexit debate on the same afternoon in the commons chamber, the houses premier debating chamber. Tonight I have asked Andrea Leadsom, Leader of the House of Commons, to respond. After all, it’s her job to announce every Thursday the timetable for Commons proceedings for the following week. When Ms Leadsom announced that there would be a debate in the House of Commons on the afternoon of Monday 10 September, she already knew that the Commons Petitions Committee had also scheduled the debate on the petition to rescind Article 50 on the same afternoon. (I will report back here if I receive a reply from Ms Leadsom). 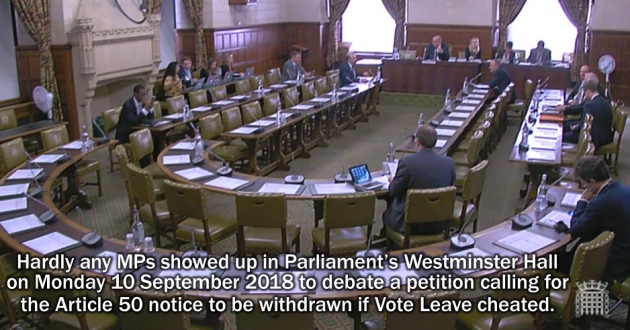 During the debate about the petition in the empty Westminster Hall, the Brexit minister Chris Heaton-Harris said that while the government “respects the views and wishes” of those who signed the petition, the referendum result was one that “cannot be ignored”. And Labour’s shadow Brexit minister Paul Blomfield said the law did not provide for overturning referendum results for cheating. ‘The British people voted to leave the EU, and it is the duty of the Government to deliver on their instruction. There can be no attempt to stay in the EU. ‘The result of the referendum held on 23 June 2016 saw a majority of people vote to leave the European Union. 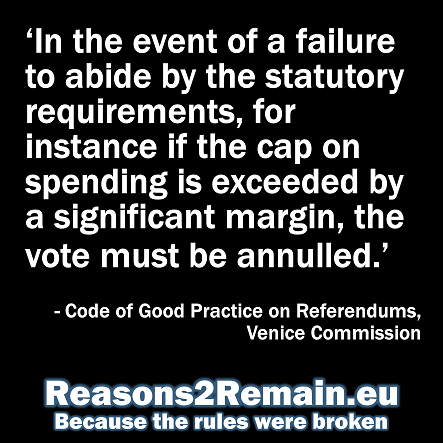 This was the biggest democratic mandate for a course of action ever directed at any UK Government. ‘Following this, Parliament authorised the Prime Minister to trigger Article 50, passing the EU (Notification of Withdrawal) Act. ‘In last year’s General Election, over 80% of people then voted for parties committing to respecting the result of the referendum. ‘It was the stated policy of both major parties that the decision of the people would be respected. The Government is clear that it is now its duty to implement the will of the electorate. ‘The British people can trust this Government to honour the referendum result and get the best deal possible. 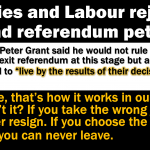 To do otherwise would be to undermine the decision of the British people. But the statement, by the Department for Exiting the European Union, made no reference to the cheating by the Vote Leave campaign and did not answer the premise of the petition, that Article 50 should be rescinded in the event that Vote Leave broke electoral laws. So, it appears the government believes that promises made by their politicians need to be ‘honoured’, even if those promises are based on lies, and the campaign to win the EU referendum was based on cheating. So much for democracy and fair elections. But even if Westminster Hall had been filled to the rafters with MPs, it would not have made any difference. Although almost 200,000 people signed the petition for the Article 50 notice to be withdrawn if Vote Leave cheated, petitions carry no weight in Parliament. Of course, the vote can only be ‘Aye’: the petition has been considered by MPs. But it’s meaningless. Petitions to Parliament are meaningless. Democracy in the UK is becoming meaningless. This entry was posted in Current Affairs, Democracy & Citizenship, Politics & Public Policy, The EU and tagged Article 50, brexit, European Union, Parliamentary petitions, Westminster Hall. Bookmark the permalink.